About a year ago I posted a brief bit of information about bières blanche from northern France on the blog's facebook page (here and here). Thanks to a friend in Brussels with a good library of historic texts, I was able to locate a bit more information about these beers. This post expands on those initial FB posts with the additional info that I've tracked down. But there is still a long way to go to understand these beers, and I'll continue to look for more sources. The Nord region of Northern France was an active brewing center around 1900. At this time, breweries in the region were still producing traditional beers of top fermentation. The influence of imported lagers was shifting brewing elsewhere in the country toward lager production. Unfortunately, while traditional beers could still be found in the Lille and Dunkirk areas, they were also in a period of decline here. With WWI coming and the state of brewing in the region already in a tricky spot, the region saw large changes for brewing in a rather short amount of time. I've written about biere of the region in these two posts here (mainly on mashing) and here (mainly on WWI). to historic French brewing. From the breweriana collection of D. Thiriez. So back to the beers of the Nord. Most of us have probably heard of one of these traditional beers - bière de garde (note that bière de garde in 1900 was different from the modern versions) - but other beers were made in the region as well. And I haven't seen much mention of these other beers. While looking for information about French bière de garde about a year ago, I found mention of a bière blanche. I hadn't heard of this beer before and it interested me, but there was very little info to go on in that brief mention. With this new source I'm starting to get a bit of a better picture about this beer and wanted to put up what I know at this point. Of course, as with other posts on historic brewing, the same caveats apply - namely that this is a small snapshot of the beer (as the beer likely changed over time as well as among different producers) and this understanding is limited to the info given in a few sources. 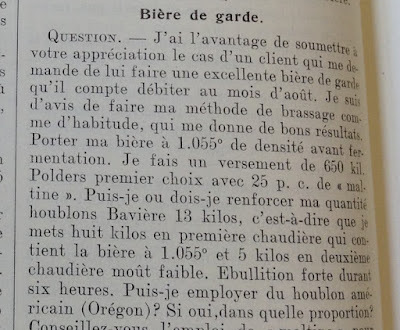 This discussion draws from two main sources - Petit Journal du Brasseur (1910) and Moreau and Levy (1905). The both refer to blanche in general and the latter specifies a beer called Blanche de Cambrai. In the modern world, this latter name applies to a distinct beer made from one brewery. But historically it was a style of beer brewed by many brewers in the region. The same thing - where a style turns into the product of only one brewery - can be seen elsewhere in Europe (e.g. Grisette and Hoegaarden). I'm not sure if the brewery making Blanche de Cambrai holds a trademark on the name, as is the case with the other two examples. When discussing Blanche de Cambrai for the rest of this post, I am referring to the historic style rather than the modern brand name. Historic Blanche de Cambrai mostly matches the general description of blanche in PJB, but there is a notable difference in attenuation. On the whole, these white beers don't seem very common but they were produced at multiple breweries in the early 1900s. They are noted as having a short boil or possibly none at all (though in the latter case beer would be held at boiling temps, so maybe more of a simmer than no boil in the modern sense). For the time this is quite unusual as beers could easily have a multi-hour boil, possibly approaching 8-12 hours or more. The blanche beers seem to be of moderate gravity (~1.035-1.040) and were lightly acidic. Some of the parameters of the beers are shown below, along with comparison to other blanche beers and acidic beers, both modern and from ~1900. These northern French white beers are described as having a good hop aroma. The attenuation was either moderate or high. It seems the beers were consumed around 3-4 weeks from brew day (or possibly a week or two older). Parameters of northern French Blanche and historic and modern Belgian and German acidic beers. The grain used is described as being as pale as possible. Moreau and Levy note that an ordinary brown beer was brewed at the same time and from the same grist as this white beer (this brown beer is not completely straightforward, but that is a topic for a later post). Unlike bière de garde, which would use a form of turbid mashing, it seems that the white beer is produced by infusion mashing. About 25-30 kg of grain is used for 100 L. I interpret this to mean 100 L of each blanche and brown beer (it isn't explicitly clear, but given context and expected extract this seems necessary). There is no discussion of grain breakdown (and actually no mention of wheat by name in either source). The barley used in this region was mostly a winter 6 row. There is also general mention of brewers in the region using a bit of straw to help with the lautering, which agrees with other beers brewed with wheat at the time in Belgium such as lambic and grisette (as discussed here). Moreau and Levy note that some brewers use rice. Initially a cool infusion is made and the mash is quickly drained. This is effectively a rinsing, and is done to remove some of the color of the grain. This rinse is held to the side and will be added the the brown beer. Then the mash is raised to a low saccharification temp, where a long rest is performed (~1 hour of stirring followed by 75 min of rest). After this the mash is drained and first runnings become the white beer. Note however that the white beer is not especially strong. The remaining runnings (and the cool rinse) going to the brown beer. The white beer portion is boiled for up to about an hour (though Moreau and Levy note that some brewers only hold the wort near a boiling point, in agreement with PJB). Hops are only added in the cooling tuns or at the end of boiling (preferably in the cooling tun), but the hopping rate is fairly high at ~9-10 g/L (compare with grisette and saison/Belgian bières de garde here and with lambic here). Moreau and Levy note that some brewers spiced their beers with coriander, star anise or iris. The beers are fermented with ale yeast (which, given the time means a mixed culture of bacteria and/or other yeasts such as Brettanomyces). Although the hopping was high, the hops were not boiled and some acidity is able to develop. The beer was bottled (with priming sugar) after a couple weeks and was carbonated a couple days later. All this seems like an interesting beer - light acidity, low gravity (in the modern sense) and hop flavor but not so much bitterness. It sounds like it would be pretty refreshing. The brewing process described in Moreau and Levy seems pretty unique and I wonder if other brewers in the region followed a different process for their beers. And/or if similar process shows up for other beers elsewhere. Overall I think this is a cool, if uncommon, component of northern French beers from ~1900. And hopefully I can find some more info elsewhere about these beers. Traité Complet de la Fabrication des Bières (1905), Moreau & Levy.